HEADS UP! I created a free webinar just for influencers that gives you my 5 steps to land brand collaborations, media and negotiate your best rate possible! Check it out! Let’s imagine for a moment that your name is Allison and you work for a well-known lifestyle company. You are looking for a fantastic lifestyle influencer that aligns with your company’s messaging and mission to PAY for a collaboration. As the brand representative, you know you have an amazing product, brand, and a fabulous budget. You can’t wait to find the perfect influencer to work with, and you are excited to grow this relationship. So you (Allison) start to scroll through Instagram looking for that ideal influencer. You know she is out there, as Instagram is the #1 place where influencers live. But minutes pass, and before you know it, it’s been 45 minutes and you haven’t found a single influencer that is a good match for your super FAB and BANKABLE campaign. So what the fake Instagram bio’s I created are telling us is, maybe, some vague adjectives that describe who they are, and sometime a thrown in location. Perhaps they have a blog? I am guessing by the name of their email or website they have a blog, but don’t know for sure. And then they add something else about their life that really has nothing to do with them as an influencer. So far, to be perfectly honest, these imaginary people have only talked about themselves in a way that gives me, Allison, 0 direction as to who they are influencers, who their audience is, what they do and WHY they are a great person to align with. Sometimes the bio’s get repetitive, like in the first example. She tells us she’s a blogger at Southern Sass w/ Class twice, as it clearly states that in her URL. We know she’s a blogger, but we have no idea what she blogs about or WHY we should check it out, nor is there a call to action. Here we have so many wasted characters and nothing that tells me (Allison from the amazing lifestyle company) why I should invest in her. Think about it, if you were a brand or potential new follower, would you care to learn more about or follow these imaginary people from above? Would you want to collaborate with them? Perhaps these examples are making you a wince a little because they look like your bio? Now, don’t start to crawl in a hole. We have all been there, and that is why we are here now, to change it so it works FOR you. How do you do this? With your elevator pitch! Your elevator pitch is your introduction to the world. It’s how you awaken the magic and connect people to your world and what it is you offer. It tells the audience what’s in it for them; what they are getting if they collaborate with you. I have an elevator pitch equation containing 4 steps that will help you stand out and attract brands. WHO I AM + WHAT I OFFER + HOW IT SERVES OTHERS + WHY IT MATTERS. Who I Am is a clear-cut description of exactly who you are as an influencer or brand. This is where your education, experience, inspiration, location and background are highlighted. What I Offer tells the story of the solution you provide, specifically, what is the audience getting from you. How It Serves Others solves their problem. The only way you will ever be an effective influencer is if you, in fact, influence people to make a change – the best way to do this is to be their solution provider. Why It’s Important is basically what’s in it for them, what is the audience getting out of engaging. Free gift or tidbits you can offer here are great. So here we have Who she is, What she is offering and Why it’s important – a wife who covers topics pertaining to the first year of marriage. Now, it might not be her 1st year of marriage, but the audience she is engaging will either be engaged or newly married. This keeps her audience specific, while at the same time always growing. Being specific here is so important because, if you’re talking to everybody, you’re talking to nobody. What new wife doesn’t want tips on how to create a blissful and delicious first year of marriage, right! She also adds some additional information about who she is including her location, some favorites and a contact email that also tells her blog name, so we don’t have to repeat that later. Then the most important piece - we have the how it serves others with the free cookbook. She has already started a relationship with you by hooking you in with free swag that is helping you create a happier home! To give you one more example, let’s take a look at my elevator pitch. • WHY IT’S IMPORTANT: It Helps Grow Their Brand And Income. It’s important to make sure your bio and profile picture are the same on all social media platforms. Not only are you staying cohesive and streamlined that way, but it allows for people who read your bio and see your picture on each platform to start remembering your brand. Take some time to consider your elevator pitch, and how it translates in your bio and in your emails. Use the elevator pitch worksheet I’ve included in this post to streamline your bio and elevator effectively. Download it below! Keep it mind that your elevator pitch can and will change as you grow, so don’t be afraid to change it up. I do this frequently throughout the year depending on what I may be promoting at the time. But the pitch elevator equation stays the same. Promise me that you will start taking action today, because a year from now you’ll wish you’d started today. 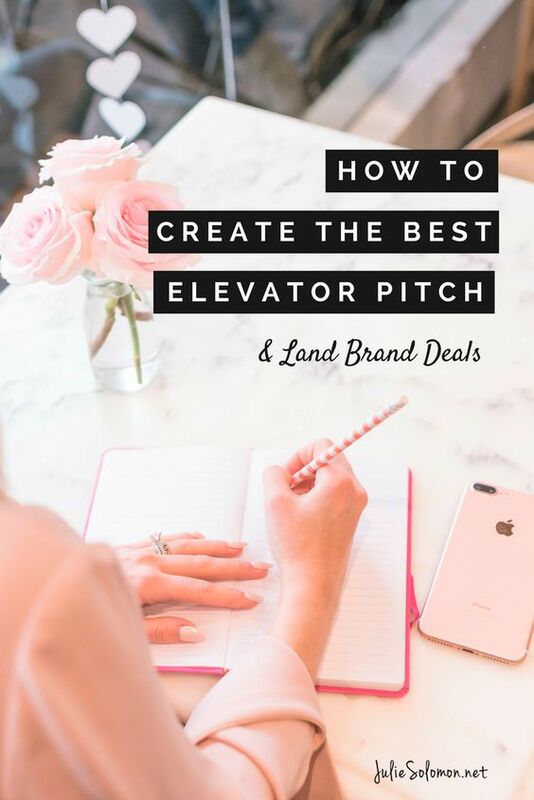 If you want to learn more about your elevator pitch, and how to land deals from it, I encourage you to check out Pitch It Perfect, a course I created that helps you land your first $5K in brand deals, attract more followers and pitch like a pro! How do you use your bio to attract business growth and followers? What have you found that works well, and what have you found that doesn't? Any advice to share with us? Please leave your comments and thoughts below by clicking the "comment" button at the bottom.